Tap dance was developed in the United States during the nineteenth century, and is popular nowadays in many parts of the world. The name comes from the tapping sound made when the small metal plates on the dancer’s shoes touch a hard floor. This lively, rhythmic tapping makes the performer not just a dancer, but also a percussive musician (and thus, for example, the American composer Morton Gould was able to compose a “concerto for tap dancer and orchestra”). The Encyclopedia Britannica definition for tap dance is: A style of American theatrical dance using precise rhythmical patterns of foot movement and audible foot tapping. It is derived from the traditional clog dance of northern England, the jigs and reels of Ireland and Scotland, and possibly the rhythmic foot stamping of African dances. Popular in 19th-century minstrel shows, versions such as “buck-and-wing” (danced vigorously in wooden-soled shoes) and “soft-shoe” (shoes) developed as separate techniques; by 1925 they had merged, and metal taps were attached to shoe heels and toes to produce a more pronounced sound. The dance was also popular in variety shows and early musicals. 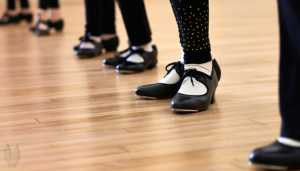 Tap dancers make frequent use of syncopation. Choreographies typically start on the eighth or first beat count. Another aspect of tap dancing is improvisation. This can either be done with music and follow the beats provided or without musical accompaniment, otherwise known as a capella dancing. Hoofers are tap dancers who dance only with their legs, making a louder, more grounded sound. This kind of tap dancing also called “rhythm tap”, is typically found in cities or poor areas, but this is not always the case especially with such a wide [variety] of styles spreading throughout the world. Steve Condos rose out of his humble beginnings in Pittsburgh, PA to become a master in the rhythmic tap. His innovative style influenced the work of Gregory Hines, Savion Glover and Marshall Davis, Jr.